A must for every cyclist is a visit to the Italian Cycling Resort. 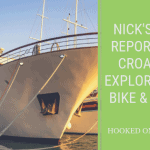 Hooked on Cycling introduces Riccione located on the Adriatic Coast, which is quickly becoming a biking vacation Mecca. Cyclists come from all over the world to spend time cycling in the wonderful landscapes and enjoy the special hospitality offered. This cycling holiday is suitable for leisure cyclists, tourists, club cyclists and also their families. Our cycling holiday is a guided fixed location cycle trip, but you are also free to cycle self-guided. Some weeks you can expect the hotels to be almost full just with cyclists. Centrally located the Italian regions of Emilia Romagna, Umbria and Marche regions which simply live and breathe cycling. Apart from the crystal blue seas giving wonderful coastal rides there is the green lush hinterland behind the coastal resorts. Here in spring you get peach blossom and wild roses and in autumn the first truffles and chestnuts. Cycling out of the peak Italian holiday months is a real pleasure with quiet lanes, ancient medieval villages to cycle through, great scenery and all with the knowledge you are with an expert guide leading the way. One of the most popular tour during the week is the tour to San Marino the Tax free Republic. The long climb to the top is rewarded with beautiful views never to be forgotten. Our base is a beautiful 4 star hotel fully renovated in 2005 and around 5 minutes walk from Riccione centre, but only 75 metres from the beach. We have selected this hotel for their warmth of welcome and fabulous hospitality. Wonderful buffet-style meals (vegetarian’s catered for) to fill the hunger of any cyclist and great wines await you. Wine and water is included in your evening dinners and in the afternoon a pasta snack is provided to replenish the energy before dinner. The hotel has a heated pool and an indoor splash pool with a wonderful wellness centres. For families with one or two cyclists, there is much to do, if both parents cycle the hotel can arrange child sitting (there may be an extra charge). The hotel is close to the beach where you can go for walks or play in the play area. You can also walk up to the main shopping area and relax by the beach with an ice cream! After your daily ride, why not sit around the pool after your days cycling with a glass of wine, beer or espresso! The hotel has dedicated cyclist facilities including washing service for cycling clothes, safe storage, workshop, energy kit to take while cycling (sandwich, bananas etc). At least 5 (often more) days a week, the dedicated cycling guides will organise group rides of various lengths from 25 miles up to around 90 miles, if you wish to follow one of the prepared tours around the superb countryside independently. The guides determine the route length based on their guest requirements. For the non-cyclist there is much to do in Riccione, beach, boutiques, shopping malls and activities organised at the hotel. Children are also well catered for with play areas and activities. Please note that in the summer months of July to the first half of August the hotel shall have fewer cyclists present and more families. Do not miss this opportunity you will want to go back time and time again! At least 5 guided rides per week (often more) from March to June and September to October. To Bologna, Ancona or to Rimini airports were we can arrange transfer to the hotel if required, transfers are paid locally. You can also take the train direct from Bologna or Ancona to Riccione.